Black pochette Epi, from Louis Vuitton.Textured dress, by Rahul Mishra. 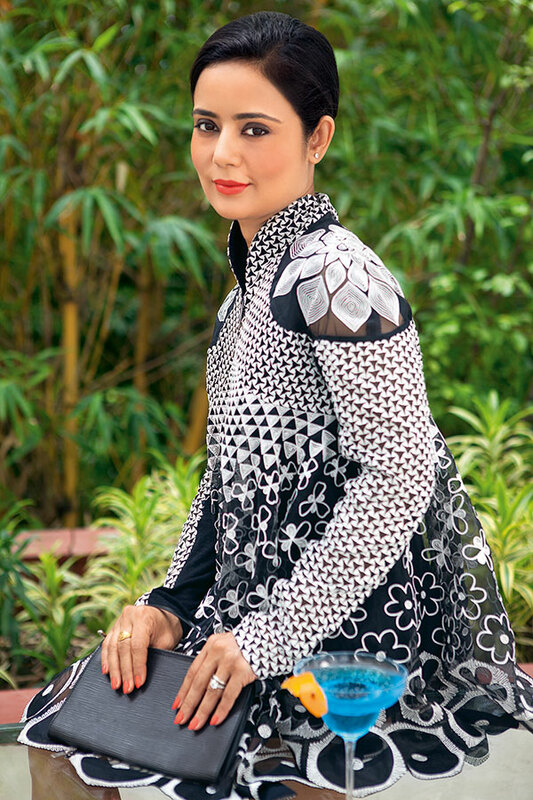 For a full-time politician with the Trinamool Congress, Mahua is one stylish woman. A charismatic personality, Mahua is never seen without her crisp cotton saris and a Louis Vuitton slinging on her arm. As she enters the suite in a beautiful Rahul Mishra creation from his latest Fall/Winter collection, Mahua doesn’t fail to impress from the start to the end. “I need to wear my clothes rather than the other way around. Nothing should be too overwhelming. When I’m working I wear only saris in natural and handloom fabrics from Bengal and Jharkhand regions. For an evening out I prefer dresses. I wear a lot of Indian designers like Rahul Mishra, Anamika Khanna, Dev R Nil and international labels like Moschino and Burberry to name a few.